Abstract: Contraction of VjV sequences to V as in aja > a, aje > a, ojo > o, uju > u, eje > e, ije > i is found in northern and central Russian dialects, primarily in non-past verb forms and in adjectives. The focus of this paper is on the manifestation of this process in verbs and specifically on the resistance to contraction found in the 2pl forms. There are several different explanations in the literature for the exceptionality of 2pl forms, but they are not entirely convincing. I propose a new and more comprehensive explanation for the resistance to contraction in this category based on the notion of paradigm contrast. 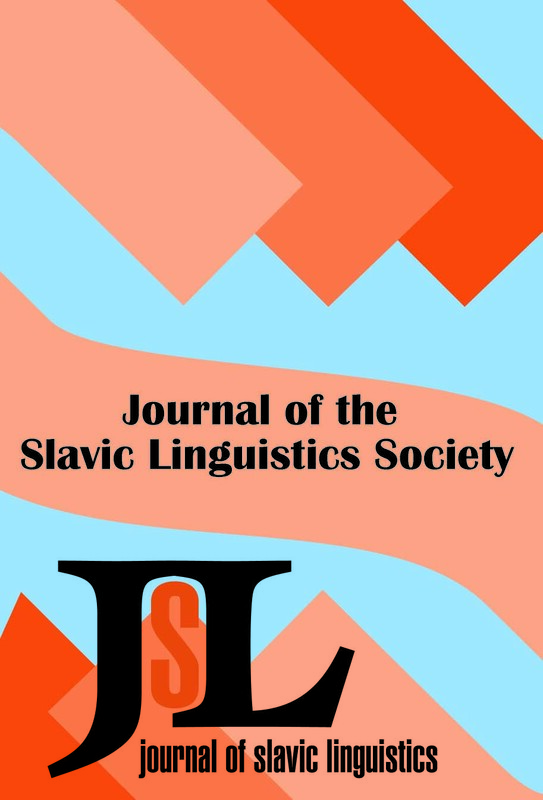 Abstract: The hyperintensional South Slavic involuntary state/feel-like construction is interesting in that it is restricted to a peculiar syntactic frame (dative subject and reflexive-impersonal or reflexive-passive verb) but has no overt element encoding its desiderative meaning and its intensionality. Recently it received two very different analyses. For Marušič and Žaucer (2006a), the construction is biclausal, with its desiderative meaning coming from a phonologically null verb. For Rivero (2009), its “modal” meaning arises from a viewpoint-aspect imperfective operator in a monoclausal structure. The aspect-based account poses a challenge for the theory of null verbs, since it cancels what had been considered a rare attestation of the theory’s logical possibility of having a null matrix verb. It also poses a challenge for the sententionalist view of hyperintensionality, since it posits that the latter can arise outside a clausal complement. This paper demonstrates that the aspect-based account is problematic in several respects and reinstates the null-verb analysis. Abstract: This paper reports on a peculiar phenomenon in Russian which involves both a Y/N marker (li) with a wh-word. Under consideration are the two incarnations of this construction—herein called Hybrid Wh-coordination (HWh) and its reverse counterpart (rHWh). In the former the Y/N marker precedes the wh-word (and the coordinator), while in the latter this order is permuted. This surface difference has deeper underpinnings, since the two constructions do not behave in identical fashion with respect to various diagnostics. Hence they are not amenable to the same treatment. I will argue for a biclausal genesis of HWh questions. The rHWh cases, on the other hand, are ambiguous between biclausal and monoclausal structures, depending on the nature of the wh-word. The paper offers novel empirical generalizations, cataloguing previously unreported facts associated with hybrid coordination, as well as some theoretical contributions, bearing on the status of Across-The-Board extractions (ATB), quantifier raising (QR), li-placement, and the distribution of topicalized constituents (TC). In particular, the paper presents arguments in favor of QR in Russian. It is argued that the clauseboundedness restriction can be repaired under ellipsis. ATB movement is analyzed as a process of extraction out of each participating conjunct. The placement of li is understood as a result of PF reordering, which is distinct from Prosodic Inversion. Finally, D-linked wh-phrases are analyzed on a par with TCs.